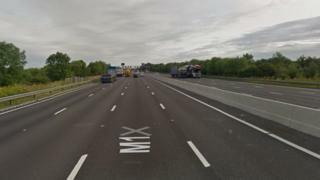 A woman has died after a car crashed into a broken-down vehicle on the M1 motorway near Sheffield. The 62-year-old passenger suffered fatal head injuries in the crash on the northbound carriageway, a mile north of Woodall Services, on Sunday night. A black Mercedes struck a grey Nissan Qashqai that had stopped in the left-hand lane of the motorway where there was no hard shoulder, police said. A man has been arrested on suspicion of causing death by dangerous driving. Both the victim and driver of the Nissan got out of the car at about 21.40 BST, South Yorkshire Police said. About 15 minutes later, the Mercedes smashed into the car pushing the Nissan forward and hitting the passenger, a spokeswoman said. As a result two other cars were in collision with the Mercedes and "each other". The woman was pronounced dead at the scene. The 30-year-old remains in police custody. Officers have appealed for any witnesses or anyone who saw any of the vehicles involved prior to the collision to come forward.